Based on the monumental work of Vitorino Magalhães Godinho, this paper develops three fundamental themes: history is geographical; history speaks of a multi-dimensional, though singular, activity; the past is relativized in the present. The conclusion delineates a programme of work for the new century, based on the concept of total history. The “Islamic terrorist” and the culturally “inassimilable” Muslim immigrants and minorities represent the two faces of the view of Islam as the “problem of the 21st century”, an idea that dominates contemporary public debate and the formulation of national and international state policies in western societies. The nature of the more or less essentialist representations which inspire and distort these debates varies according to a few factors. These factors include the contexts produced by the historical relations (usually colonial) of each nation with Islam, by the institutions and knowledges related to it, and by the composition, profile and weight of Muslim communities in each society. But the logic of identity and security that shapes the discourse of Islam as a problem reproduces the same identity and security concerns generated in the colonial context, redefining them now as problems of multiculturalism, governance, tolerance and security. This article calls for a deconstructive approach to Islam through a critical reading of the Portuguese discourse. Contemporary political mobilizations under the banner of Islam have been variously described as a form of fascism, as a form of fundamentalism, as a form of resentment, and as a form of pathology. The inability to treat Islamism as something more than a set of pathological reactions to developments in the world means that Islamism as an object of analysis remains obscure. This paper places Islamism within the context of the current world order. This world order is centred around the West not only in military and economic but also in cultural terms. This paper is an investigation into and an elaboration on the phenomenon of Islamism and its relationship to eurocentrism. Eurocentrism as a strategy of locating the universal within western cultural practices is challenged by the persistence of the use of Islam for political advocacy. This paper examines the extent to which Islamism can be contained within a narrative which sees the history of the West as the destiny of the world. 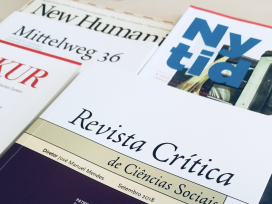 The article summarizes some of the empirical and conceptual points on which the literature on transnationalism has reached a level of consensus. They represent indicators of progress, insofar as the weight of evidence and subsequent reflection on it have gradually led scholars from very different perspectives to agree on the tenability of certain arguments and the weakness of others. Five conclusions are presented that appear to have achieved a level of consensus among specialists in this field. Eastern European migration to Portugal has changed the composition and the outlook of the immigrant population in the country. This paper discusses the main determinants behind this sudden and intense migratory movement. Based on a national survey of migrants from the Ukraine, Russia, and Moldavia, it describes the main social and demographic characteristics of this population and its main modes of economic insertion. The public identity of immigrants depends on a set of factors that range from state regulatory practices to the institutional intervention of different organizations. Immigrants rarely have a say in the construction of this identity since their access to public space is very restricted. Taking one of the privileged sites for the construction of this image – the press – this text seeks to discuss how the journalistic discourse connects a number of voices and actors, constructing episodes and “stories” that focus on issues of immigration. To this end, the authors start from the discourse of journalistic texts and analyze three news excerpts, giving an account of how the identities of the various actors involved are constructed in the press. This text starts from analyses that point to the deep crisis of associationalism which derives from the option for techno-instrumental orientations, to the detriment of civic and solidarity logics, as well as from the weakening of the political dimension. 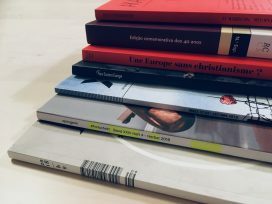 It seeks to give a contribution to the understanding of some of the trends that are becoming established within associationalism in Portugal, based on an analysis of the dominant meanings given to it by a number of specific initiatives (Local Development Initiatives – LDI). The underlying thesis points to ambivalence as one of the most distinctive features of local development associations, re-actualizing dialectical tensions that are at the centre of the paradigm of western modernity.